If your home's soffit and fascia is warping, bubbling or cracking, it's probably time to replace them. Not only does deteriorating fascia detract from the beauty of your house, but it may indicate a structural problem or a roof leak. Left unchecked, bugs, mold or mildew may take over! LYF Construction has been repairing and replacing fascia and soffits in local homes since 2003 and we'd love to help. We use premium products that will last for years. Our certified technicians have years of experience and expert training to ensure a quality job each and every time. When you call LYF Construction for your soffit and/or Fascia needs, you will be dealing with true professionals. 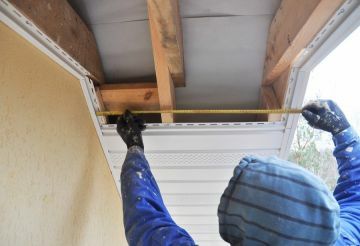 Our soffit technicians are hand selected and thoroughly trained in best practices. The materials we use are top of the line, durable vinyl siding, and trim that will stand up to time and harsh elements. When you put your trust in LYF Construction, the results are guaranteed. We back our products with a lifetime warranty on the labor and trim. Longevity – Your new materials won't rust or stain. They hold up for years! Workmanship – Our technicians utilize proper installation procedures that will look great and endure time. Free In-Home Estimates – Know your costs upfront. No hidden charges.